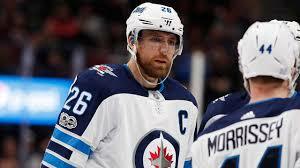 Captain Blake Wheeler scored the go-ahead goal by redirecting Josh Morrissey’s centering pass with 3:55 remaining as the Winnipeg Jets beat the host Buffalo Sabres 3-1 Sunday afternoon to snap an 0-2-1 skid. Winnipeg netminder Connor Hellebuyck made 35 saves to help the Jets end their longest winless streak of the season and maintain the Central Division lead. Winnipeg 35-18-3 earned it’s 73rd point to move two points ahead of the Nashville Predators. The Jets begin a three game homestand Tuesday night at Bell MTS Place against the New York Rangers.